Dear Parishioners: Father Shemek and I are beginning to move into our rooms this week! No doubt you’ve seen the dumpster across the street from the Rectory that has been filled these last few weeks. I am happy to report that the living quarters on the second floor of the Rectory have been renovated and freshened up. We completely remodeled the bathrooms in our living quarters replacing the original circa 1965 bathrooms as well as updating the lighting, freshening up the paint, wallpaper and carpeting. Unpacking our boxes and settling in at OLM is about to begin! The renovation continues with a similar freshening up of the priests’ offices, the dining room and the main offices in the Rectory. I am confident that this work can be completed much quicker and with as little interruption to the good order of the parish offices as possible. Father Shemek has been a real trooper throughout the entire project as he has been living out of his suitcase since June in the guest rooms above the garage. I commend him for his patience and great attitude throughout it all. But it certainly is nice to get comfortably settled in our new home with our personal belonging out of boxes and placed around us. 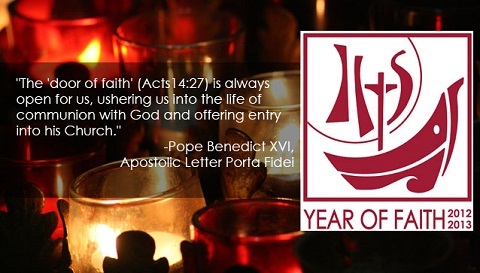 On Thursday of this week, Pope Benedict will commence the Year of Faith for our Church. The Year of Faith is a “summons to an authentic and renewed conversion to the Lord, the One Savior of the world” (Porta Fidei 6). In other words, the Year of Faith is an opportunity for Catholics to experience a conversion – to turn back to Jesus and enter into a deeper relationship with Him. The “door of faith” is opened at one’s baptism, but during this year Catholics are called to open it again, walk through it and rediscover and renew their relationship with Christ and his Church. I ask you to please pray for a successful Year of Faith, that many of our brother and sisters might return to Christ, come back to His Church and deepen their commitment to their Catholic Faith. I hope to schedule some events for the Year of Faith in the coming months that might help us experience an authentic renewal during this time. Keep an eye on the bulletin for announcements and use this Year of Faith for your own time of renewal and conversion. Our faith is in constant need of renewal and we must continually turn our focus upon Christ in order to keep the faith alive and authentic. I return from the wedding in Scranton sometime on Monday night so let me wish you a Happy Columbus Day now! God Bless. God Bless America! Go Pats.